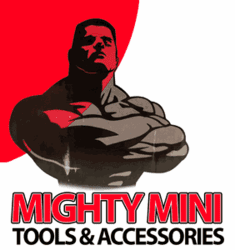 The Mighty Mini Brand is dedicated to precision detailing with tools designed to work in the tightest and most constricted areas. At the heart of the Mighty Mini product line is the Mighty Mini Cordless Polisher. The ideal tool for professionals that want to focus in on every corner of the job at hand, or the enthusiast that wants to create a legendary shine. With 3 grades of foam correcting pads available in 3 different sizes, this opens the door to how far this tool system can go. The Mighty Mini Foam Pads are composed of durable, open cell foam that is more resilient to wear that comes with the use of a rotary tool. The open cell foam also provides the ability to absorb more product, which in turn, provides longer working time and even more impressive results.